The end of the second Fantasy Comic League season of 2017 also brings with it an end to Hydra-Cap’s reign over the Marvel Universe. 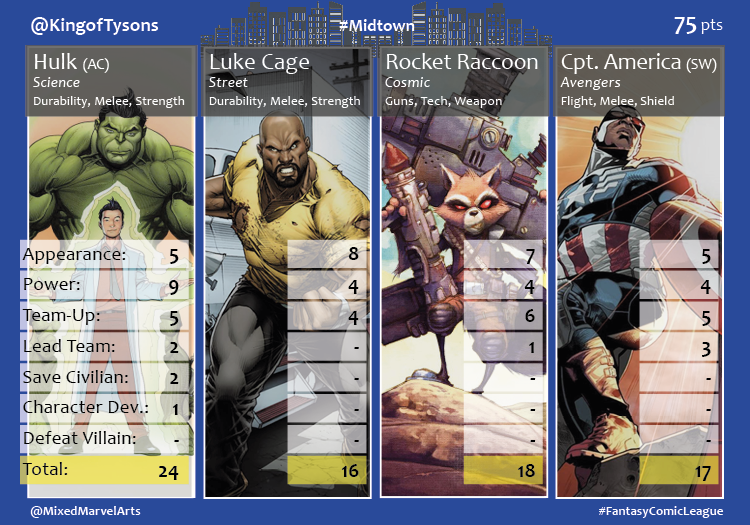 The agents of the Midtown #FantasyComicLeague division finished on another high note, as they proved to be the most formidable group in the League once more. They scored a combined 368 points and had three participants all within one point of each other. They doubled their statistics in a few key categories including 10 civilians saved, 13 antagonists defeated and experienced a staggering 15 moments of character development. For the month, Agent @robertcyoung, pulled off the win thanks to a strong final week in which all of his characters appeared in at least one book each. He scored 81 points. 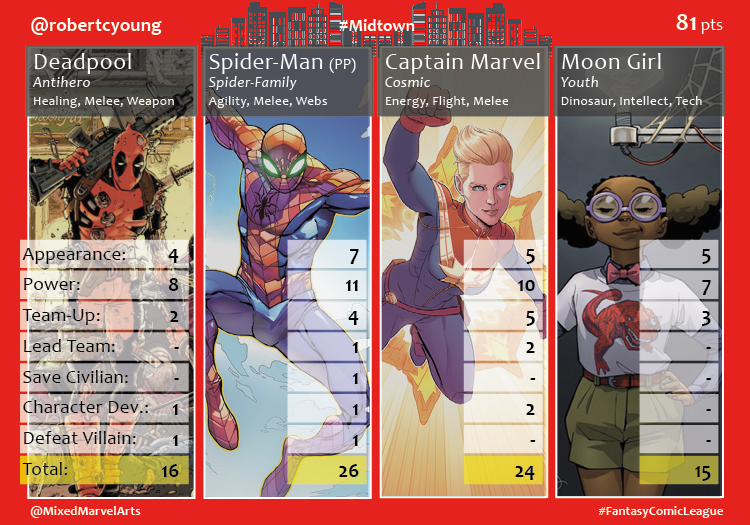 Peter Parker, his team’s MVP, hit for the Fantasy cycle while appearing in seven books throughout the month. 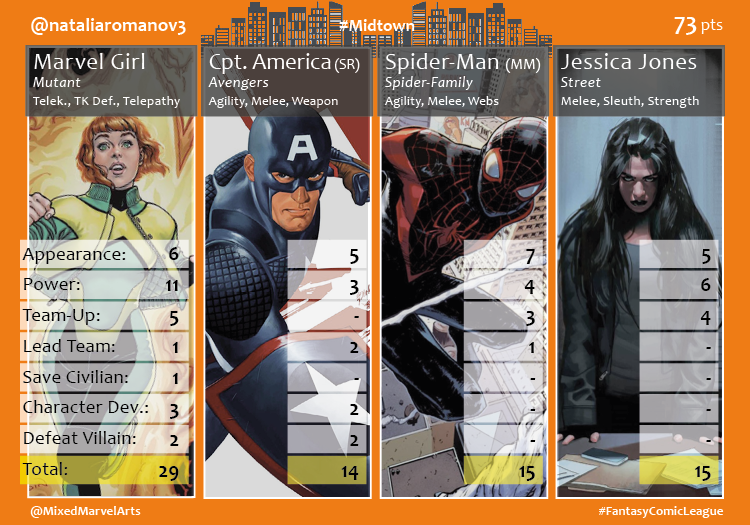 Agent @KingofTysons came up short for a second place finish, tallying 75 points on the back of another strong Amadeus Cho performance. 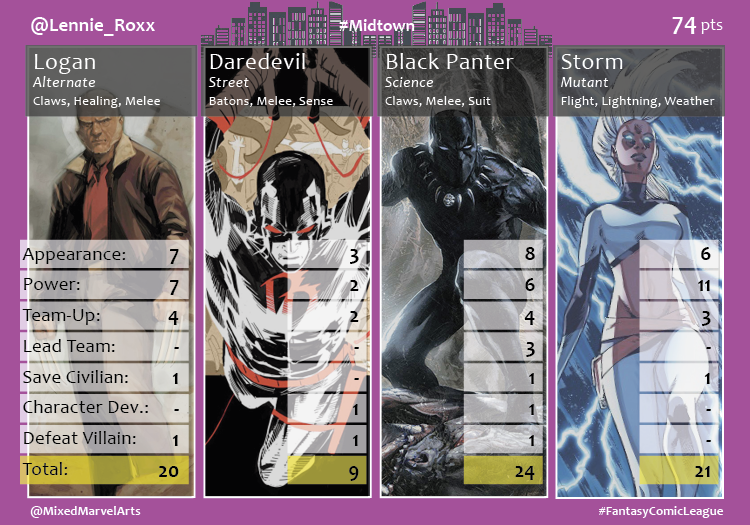 An impressive final week performance by Wakanda’s favorite power couple, Black Panther and Storm, propelled Agent @Lennie_Roxx to a third place finish with a score of 74. Black Panther also hit for the cycle. Marvel Girl had the biggest month for an individual hero. While hitting for the cycle, the young Jean Grey experienced three character defining moments, teamed up with five other heroes and dispatched two villains. Her 29 points were a large part of Agent @nataliaromanov3‘s fourth place 73-point finish. 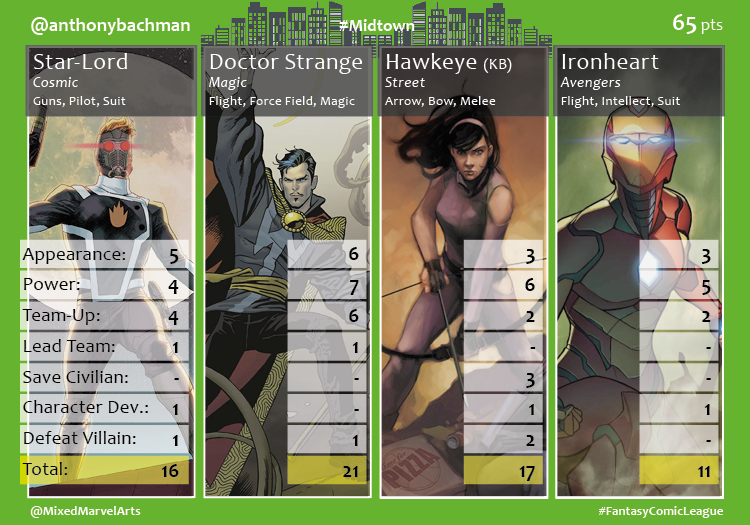 Agent @anthonybachman recruited two heroes who were both one category shy of hitting for the cycle (Star-Lord and Kate Bishop), but like his characters, came up short in the final month. He scored 65 points and finished the final month of the season in last place. Congratulations to all Midtown Agents on an extremely well-played and hard-fought season of the League. Congratulations to Robert on his overall victory for the season! September 2, 2017 in Comics, Fantasy Comic League.